This database comprises sheet music from the McLellan Lincoln Collection at the Hay Library written between 1859 and 1923. Music about Lincoln ranges from popular song to compositions for orchestral performance. Popular music about Abraham Lincoln proliferated between 1859 and 1865, and Lincoln songs are an important source for understanding attitudes of the day towards the Illinois candidate, later the 16th President, and his policy agenda. 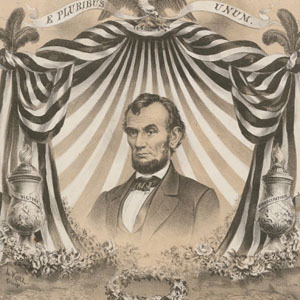 Lincoln appeared in a wide variety of music, including campaign pieces, patriotic war and memorial numbers, emancipation songs, and minstrel music. Music written about Lincoln since 1865 has tended to emphasize the epic character of Lincoln’s presidency during the national crisis of a civil war, American folk mythology surrounding Lincoln, and the use of Lincoln’s image in contemporary popular culture. Some pieces set Lincoln’s own writings to music, while others memorialize the events of his life or offer a reinterpretation for recent times. Written by Hon. H.H. Cody. Figure 3 in seven pointed star.